A South Yorkshire thug who had a drunken row with his mother and threatened police officers with two kitchen knives, is now behind bars. Yob Craig Allen, aged 28, got drunk and punched a hole in his mother's door at her home in Hall Gate, Mexborough back in January 20. But Sheffield Crown Court heard the exchange got out of hand with Allen threatening the next door neighbour over the garden fence. 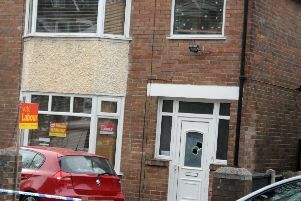 Neil Coxon, prosecuting said police were called to the home and were met by Allen standing in the doorway with two kitchen knives. Officers tasered Allen and bundled him into the police van. But later in the custody suite, Allen spat in an officer's face who was trying to shut the cell door. Judge David Dixon hit out at Allen's actions and sentenced him to 13 months in prison. He said "Your behaviour at the time was absolutely disgraceful. You behaved like an animal. Mr Coxon for the Crown said: “The police were in genuine fear of their own safety and they took the only cause of action they thought necessary through the use of tasers. Richard Haigh, defending Allen said: “There is no doubt he has a grim record and can’t complain if he gets a jail sentence. “But the probation service has said it would be best if he stays in the community to carry out his punishment. Allen, who has 21 convictions from 30 offences pleaded guilty to assault by beating, criminal damage and affray at an earlier hearing.